First Round Of Kishiryu Sentai Ryusouger Magazine Scans Posted Online! The first official scans from the upcoming 43rd Super Sentai series have been posted online! This is our best look yet at Kishiryu Sentai Ryusouger! The Ryusougers are described as legendary Knights who fight using the power of the dinosaur- the strongest creatures on Earth! Each Ryusouger has a partner dinosaur- a KishiRyu. Through special devices known as RyuSouls (which resemble dinosaur heads but also transform into smaller figures resembling medieval knights) the Ryusougers can activate new weapons, armor and abilities. 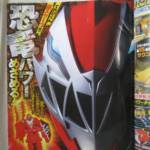 *Ryuso Red is the mightiest warrior who possesses the strongest KishiRyu- his Tyrannosaurus, nicknamed Tyramigo. *Ryuso Pink has remarkable senses and can see through situations with ease. *Ryuso Blue is the most intelligent member of the team, a dedicated swordsman. *Ryuso Green is the youngest teammate, a speedy fighter who hates to lose. *Ryuso Black is the teams’ heavy-hitter, who does all he can to protect the others. Kishiryu Sentai Ryusouger will officially begin on March 17 2019 at the conclusion of the Super Sentai Strongest Battle tournament! Stay tuned to TokuNation between now & then as we keep you up to date on this remarkable new series!